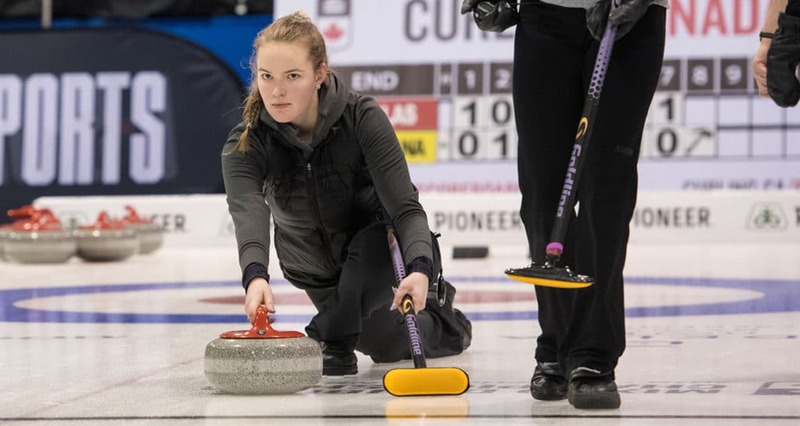 The medal rounds are set for the 2019 CCAA Curling Canada Championships. The MacEwan Griffins and Douglas Royals will battle for the women’s championship while the Concordia Thunder and Humber Hawks face off for the men’s gold. The men’s semi-final matches were conference affairs as the OCAA’s Fanshawe Falcons and Humber Hawks faced off on one rink while the ACAC’s Concordia Thunder and NAIT Ooks battled on another. Fanshawe took an early 3-1 lead but Humber chipped away at it, scoring single points in the fourth and fifth ends and two in the sixth to move in front for the first time. Fanshawe equalized the match in the seventh but Humber regained the lead in the eighth end. The Falcons drew even again in the ninth, but the Hawks finished things off in the 10th in a tremendously exciting game. Humber curled 80% as a team with Brad Lumley (85%), Matthew Garner (83%) and Sean Armstrong (80%) each having strong games. Concordia and NAIT knew each other well and the game remained tied 2-2 through six ends. The Thunder scored two crucial points in the seventh end but the Ooks got one right back in the eighth. With the hammer in the ninth, Concordia secured two points before shaking hands with the Ooks in the tenth to win 6-3. Both teams curled well with the Thunder at 84% as a team and NAIT at 82%. Braden Pelech (89%) and Cody Holowaychuk (83%) led the Thunder while Jonah Tobinski curled 93% and Brett Winfield curled 84% for NAIT. Fanshawe and NAIT will compete for the men’s championship bronze medals. Vikings led 3-0 early but the Griffins came back to even the match. The Vikings took the lead again, scoring three in the eight to lead 7-5. However, the Griffins scored two in the ninth and stole one in the 10th for an 8-7 victory and a trip to the championship game. Douglas had to face the defending CCAA Champion Fanshawe Falcons in the semis, and the Royals were up to the challenge. Douglas put on an impressive offensive display, scoring in all but two ends on route to an 11-2 victory over the 2019 OCAA Champions. Sarah Loken and Kayla MacMillan curled 88% and 79% respectively for Douglas while Erin White curled 78% for the Falcons. Fanshawe will face Augustana for the women’s championship bronze medals. The semi-final matchups for the CCAA Curling Canada Championships are set. On the women’s side the MacEwan Griffins will battle the Augustana Vikings and the Fanshawe Falcons face the Douglas Royals. The semi-finals for the men features the Fanshawe Falcons versus the Humber Hawks and the Concordia Thunder against the NAIT Ooks. All four contests will take place at the Wille O’Ree Centre at 7 p.m. AT in Fredericton. After four days and seven draws, four women’s teams ended up tied for the final two playoff spots. The Augustana Vikings, Douglas Royals, and NAIT Ooks each won their final match to improve to 4-3 while the Humber Hawks lost and finished with that same record. Based on head-to-head tie-breaking rules, Augustana and Douglas advanced to the semi-finals. The MacEwen Griffins jumped out to an early lead over the Fanshawe Falcons on their way to an 8-3 victory and top place seeding in pool play. The Augustana Vikings piled up the points early and often including four in the fourth end and four in the fifth to seal a 12-6 victory over the Fleming Knights. The Douglas Royals needed a victory to stay in contention and they played a stifling game versus the Humber Hawks. The Royals scored three in the second and added three singles while never allowing the Hawks to score more than one in any end. Sara Loken and Kayla MacMillian both curled 83% for the Royals. The NAIT Ooks and Holland Hurricanes played a tight one to end the round robin. NAIT scored two in the ninth and one in the 10th to come from behind and edge the Hurricanes 6-4. In the final round robin draw on the men’s side, the Fanshawe Falcons and NAIT Ooks battled to claim top spot heading into the playoffs. 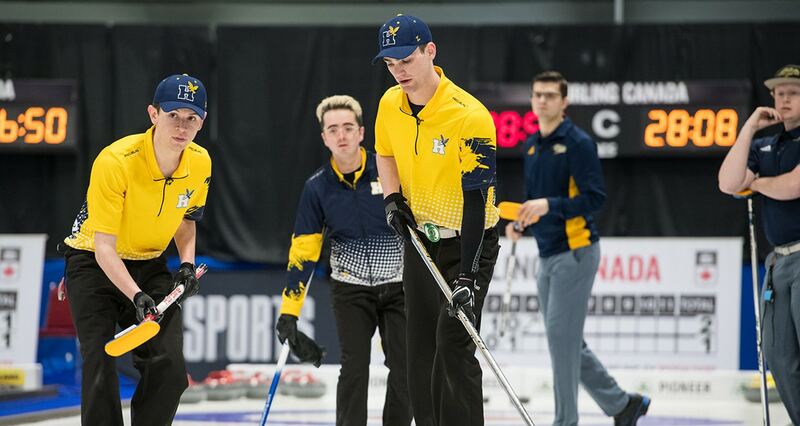 NAIT led 3-2 after seven ends but Fanshawe tied it in the eighth and went ahead by one in the ninth which featured every stone in play at the end. NAIT had an opportunity with the hammer in the 10th, but the Falcons stole one to claim a 5-3 victory. 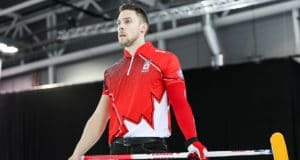 Brody St. Louis and Charlie Richard led Fanshawe, curling 90% and 89% respectively. Brett Winfield (90%) and Jonah Tobinski (89%) had great games for NAIT. The Humber Hawks versus Lakeland Rustlers match was an all-or-nothing affair with the winner advancing to the playoffs. The Hawks and Rustlers traded blows all game leading to a 6-6 tie after seven ends. Humber jumped out to a lead with a pair in the eighth, but Lakeland countered with one in the ninth and a stolen single in the 10th to force extra ends. Humber drew to the button on the last shot to win 9-8 in the 11th and secure their spot in the playoffs. The Concordia Thunder started out slow against the Confederation Thunderhawks, but persevered to win 10-3 and lock up a spot in the semi-finals. The Sault Cougars and Olds Broncos were out of playoff contention, but both teams played hard through the last end. 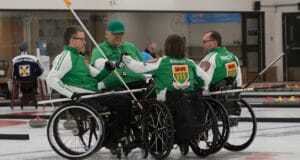 The Cougars’ Jacob Reid finished his tournament curling an impressive 93% in Sault’s 10-5 win over Olds. Next: 2019 Everest Canadian Seniors underway Friday in Chilliwack, B.C.